About the cheese. 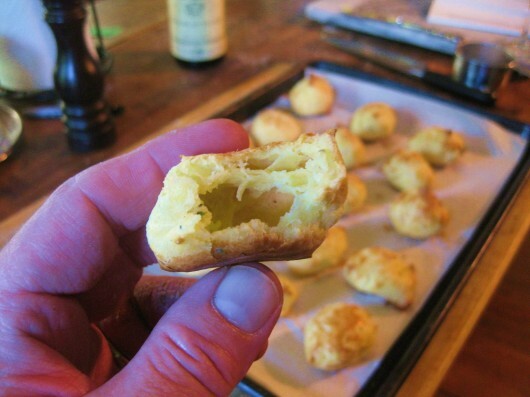 Although I use Gruyère for my gougères, you certainly don’t have to. Sharp cheddar, Parmesan, and salty Asaigo will work as well. Just be sure to grate the cheese by hand. 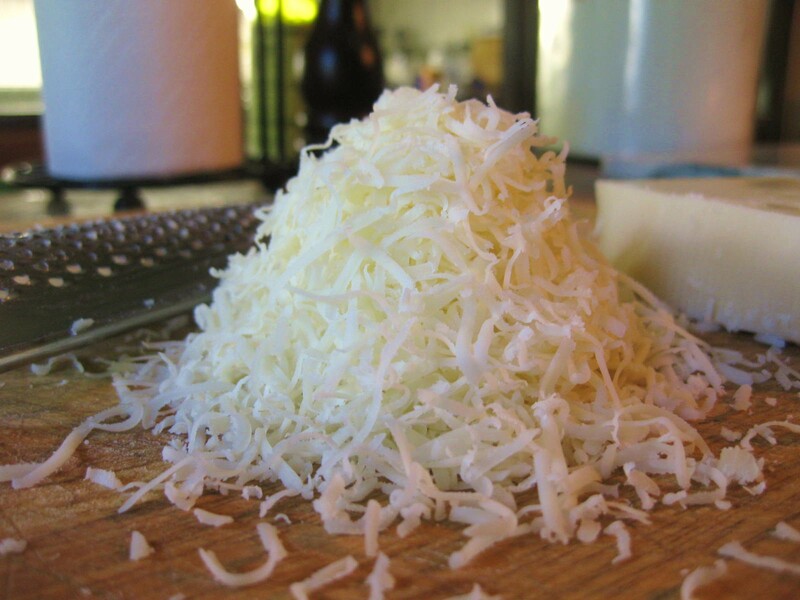 Cheese grated in the food processor, as I learned (the hard way), can weight the dough down and reduce its ability to rise. Flat-as-a-pancake gougères may be delicious, but this is not the look we are going for. 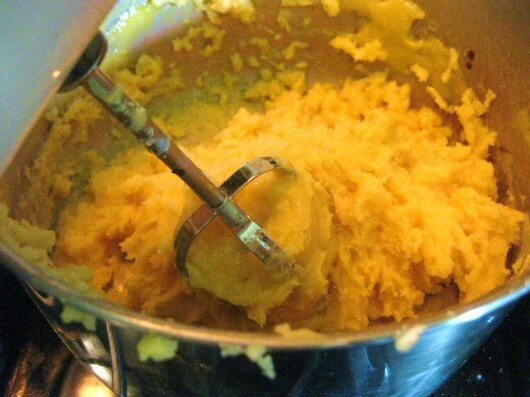 Choux pastry is made by adding flour to boiling milk or some other liquid. The flour is beaten in with a stout wooden spoon. French cooks somehow manage to beat the eggs in with a wire whip. But when I tried this, the thick, sticky dough became jammed inside the wire openings. Consequently I find it easier to beat in eggs — and air — with an electric, hand-held mixer. The Herbs. I used thyme, because I have it in my garden. But you could just as easily use finely-chopped chives, rosemary, or whatever you happen to have on hand. The gougères is a versatile thing. The only true requirements are boiling liquid, flour, and eggs. If you want perfectly-shaped balls, by all means use a pastry bag outfitted with a large tip. I could not for the life of me fine my pastry bag today (does this ever happen to you?). Consequently I used two tea spoons to form little clumps. As you can see, these baked-up and puffed-up admirably, in spite of my no-pastry-bag dilemma. Apparently gougères are very forgiving. And just wait until you taste one. Making the Dough – Preheat oven to 400 F; set oven rack at lower-middle position. Pour milk, salt, and butter into the saucepan; bring to a boil over medium-high heat. With the pan still over heat, dump in the entire cup of flour, and beat it vigorously with the wooden spoon. It will form a mass of dough that will pull away from the sides of the pan. Lower the heat, but continue to stir another minute or two, to evaporate much of the moisture in the dough. 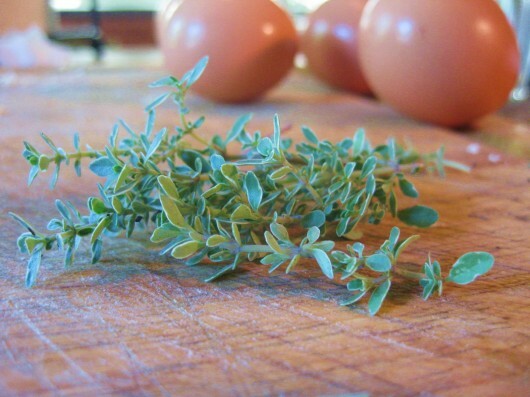 Adding the eggs, herbs and cheese – Crack one egg into a cup. Add the egg to the dough, and then immediately beat it into the dough, using your electric mixer. Repeat with the remaining three eggs, adding them one at a time. The dough will look like a thick, sticky batter. Fold in the herbs and 3/4s of the cheese. 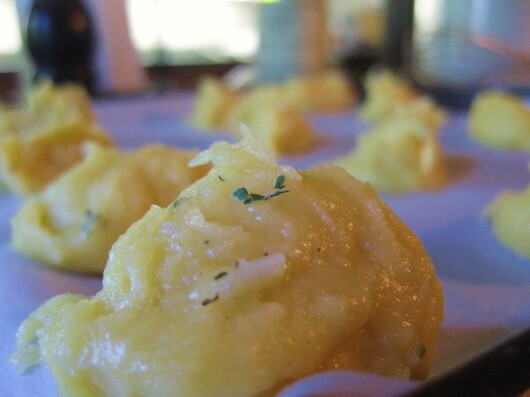 Forming and baking the puffs – Using tea spoons or a pastry bag, spoon or pipe little grape-size mounds onto the parchment-lined baking sheets, allowing about an inch or more space between them for spreading. (If you are not baking the Gougères right away, you can cover them with plastic wrap and refrigerate for several hours. Or, you can flash-freeze the little balls on the baking sheet. When thoroughly frozen, transfer to a zip-lock bag.) Sprinkle tops with the remaining cheese and a tiny pinch of kosher salt. 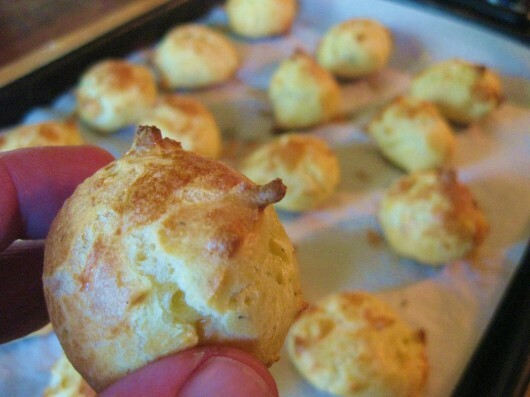 Bake the gougères until puffed and golden brown – 20-25 minutes. Serve warm or at room-temperature. 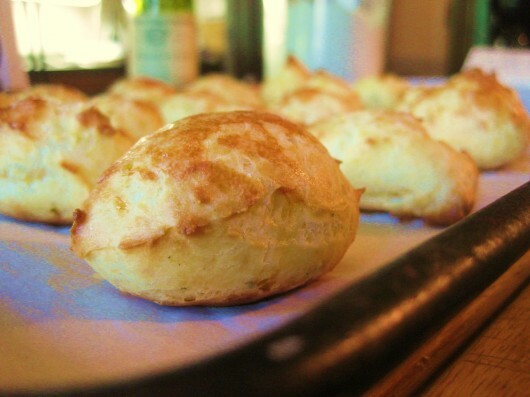 Note: To bake frozen gougères, set them on the lined baking sheet, and allow them to thaw to room-temperature. Then top them with the cheese and salt, and bake as described above. If you’d like to use these little puffs for a lunch party, just fill them with something. After all, they are hollow inside. Deviled ham and tuna salad are just two filling-possibilities. Think you’ll make gougères? You can let me know by leaving a comment. As always, I love to hear from you. How’s Your Veggie Patch Coming Along? I can almost taste these beautiful little morsels. I do plan to make them…..today………for Father’s Day for my husband. The thyme I planted earlier this year is tender and tasty and just waiting to be used in something new. Thanks for a different, very useful recipe. I am thinking I may fill some with chicken salad! Diane – Yes, great Father’s Day treat! Would be exquisite with a chicken salad filling. Thanks for the reminder Kevin. I’ve made these in the past with swiss cheese and then filled them with my delish homemade chicken salad. Happy Father’s Day to all the great Dad’s out there! These look and sound delicious!!! (of all the days not to be nearby!) I shall have to make some!!! (and I’m thinking of using some dill in them…. and doing shrimp salad in them….) What a versatile concoction!!! Thanks for the inspiration as always Kevin!!! Lori – Yummy with Swiss cheese. I might try them with chicken salad, too, and add finely-chopped fresh tarragon to the Choux pastry. Brenda – Dill in the pastry dough, and shrimp salad as a filling — I’m there! Can’t wait to try these! I haven’t made choux is such a long time. These look absolutely delicious. I love that you can make these ahead then have them on hand. Thanks for always having tips like that, Kevin. Sounds yummy. If you fill them, you just break off a piece to get to the hollow center, I gather? Sean – Ah, so many things we can do with Choux. And the gougères — if you have them in the freezer — are a cocktail party waiting to happen! 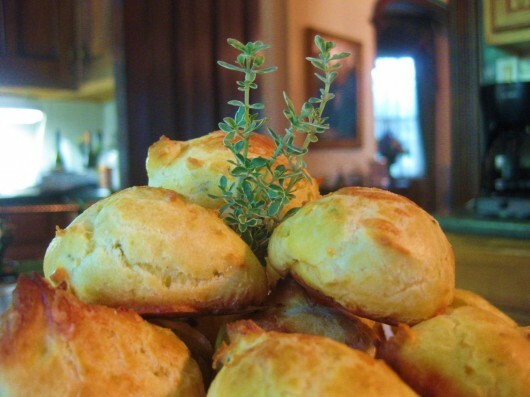 Anne B – Yes — if you wish to fill these gougères, just cut or tear an opening in the top. I came across this…and I only have 3 eggs in the house. I’m going to go give my hens a little “pep talk”. Lela – Yes, ask your hens to be a little more cooperative about your baking-needs! My husband and I are eating the ham and spinich timbale as we speak! 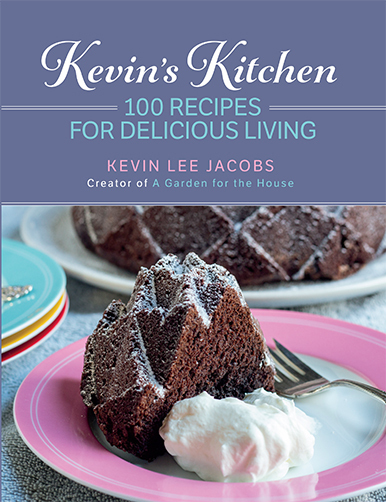 I can’t wait to make these…..thanks for all of the inspriration and fabulous recipes. Cynthia – Yeah! So glad you are enjoying the timbale, and took the time to tell me so. These were a hit at my Fourth of July party. My friends kooky husband started dipping them in the salsa and it caught on, soon everyone was doing it. Strange but true. Kevin, I made these to serve with a pasta salad, along with other goodies, at a baby shower this past Saturday. They were an absolute hit! This was the second time I had made them and I think they get better and better. The first time I used Gruyere and the second time, Asiago. Both were divine. Thank you for all the delicious recipes you post, and for your inspirational newsletter. Oh my! I think I truly must try these! As a teenager when Home Economics was still offered in high school I remember learning how to make cream puffs and I made them often for many years following that. I am now older (much older lol) and now this seems to have reappeared here for me. I love the savoury aspect of the recipe! I’m going to try these for sure!! just printed the recipe! must give these a try and the fact that they can be frozen is perfect! Hi Maggie – Let me know how they turn out for you. I love ’em! I made these and got raves. I’m making them again for a dinner party tonight (I’m taking the appetizers) and trying various fillings, one is a cream cheese filling with my homemade pepper jelly. Thank you so much for all the great recipes! I’ve also tried the baguettes and the no-knead bread. Excellent! I re-subscribed because, for some reason, I hadn’t been receiving your newsletters. Hi Phyllis – So glad the gougeres are working out for you. Love your filling-ideas. And thanks for re-subscribing! I made these for a party for 150 ladies, they were a hit! Everyone loved them! 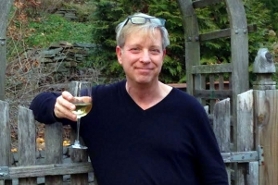 Hi Susan – Kudos to you!